Big, bigger, The Box! Within the 3D printing industry, experts experiment with extremes such as printing on a nano scale or aim for big solutions. Especially in industrial 3D printing manufacturers are in need of printers, which can print large parts e.g. for trucks. Most industrial 3D printers are already able to print metal or resin, but not accurate when it comes to printing with FDM (Fused Deposition Modeling). But, in contrast to metal, FMD 3D printing can be scaled up to create big parts. 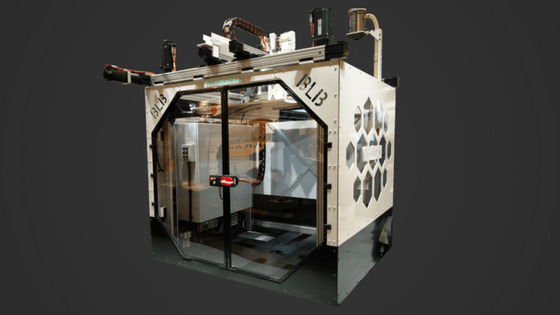 This is what the Swedish startup BLB Industries uses in their The Box 3D printer – one of the biggest 3D printers in the world. The size of this printer is somewhat impressive: It is 1500x1100x1500mm big and can print anything ranging from a golf ball to entire furniture. The best thing about it: It can print around 6 kilos of plastics per hour! Additionally, it is not just able to print very fast but also a great variety of granulates, for example, carbon materials or wood-based plastics. This offers a number of opportunities for industrial printing of the future. The Box uses multiple print heads and a hot vacuum bed, which contains 6 separate zones: “It allows you to print on the bed without the fear of the model letting go of the surface. When the print is done you can turn off the vacuum and pick out the model without sticking to the bed surface”, so Cim Bergdahl, Co-Founder of BLB Industries. Another advantage of the separate zones is that you can print a bigger item and a smaller one simultaneously. This adds to the high flexibility of the printer. It is built from different modules, which perfectly adapt to the needs of manufacturers. Users can, for instance, easily upgrade or change it in size of function. The idea for the biggest 3D printer sprung from the Swedish student team around Jacob Lundin and Cim Bergdahl during their studies at Värnamo College. There they worked on a prototype, which became a vision: to create the biggest 3D printer in the world. Following they founded BLB Industries and were joined by Thomas Burman, a mechanical engineer. The team received much support from the Herber Engineering Facility. There they can use the staff and machinery, profiting from their expertise. The Box is available at around $ 500,000, but still, there is no commercial release date yet. Stay tuned for news on the printer and BLB Industries. What do you think? Will manufacturers use big 3D printers in the future? What would you print on it? Leave us a comment below. This is amazing, how far we have come, in such a relatively short time. Great article. industrial 3D printing manufacturers are in need of printers, which can print large parts e.g. for trucks.